Fire fighting capability is based on a pumper truck and equipment from the community fire hall. Portable forestry equipment is also available for grass and brush fires. Community water trucks provide back-up water supply. Medical response comes from the federal nursing station based in the area. It is staffed by doctors, nurses, a dentist, and community health workers. The nearest hospitals are located in Norway House, and Thompson. There is also an Emergency Rescue-First Response Team as part of the fire department operations, as well as a community-operated Provincial ambulance service. 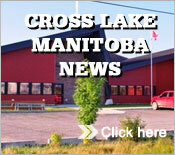 Police response comes from the Cross Lake detachment of the RCMP. Manitoba Transportation and Government Services, Northern Airports, operate a 3,000'x95' crushed rock strip with terminal and remote-controlled lighting on the edge of the community. Office is in Winnipeg. Forged from concrete and steel, it stands tall and mighty over the halcyon and bucolic waters of the Nelson River. Through the brightest of days, and darkest of nights it carries the people of Cross Lake safely from one side of its embankment to the other. One does not need to contact the bridge, for it is a patient guardian of the way, and will not shirk its duty. Manitoba Telecom Services provides individual-line service and digital switching with toll-free calling to Thompson and Norway House. Water is pumped from Cross Lake to a chemical feed treatment plant where it is filtered, chlorinated and fed to a reservoir. Ninety percent of the community has piped distribution. The remainder of the community has trucked water delivery. Garbage pickup service is twice a week on a contract basis, and waste material is delivered to the solidwaste disposal site. Sewage is collected by pump-out truck from those homes not on the low-pressure and gravity systems. The sewage is delivered to a sewage lift station, which empties into a wastewater lagoon capable of handling 305,400 litres a day. Frontier School Division operates the D. R. Hamilton School in the community. The staff is comprised of the principal, teachers, and several support staff.